Given the city’s next 5 year plan to expand its urbanised area West through policies encouraging urban growth specifically in the direction of this existing green corridor, an alternative approach was required to demonstrate the possibilities of a complex multi-layered urbanism that could accommodate this growth (including new leisure programs) while retaining the natural and production ecologies on the site. 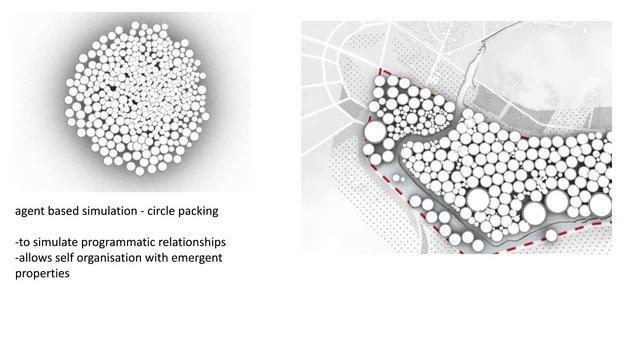 The urban proposal is specifically aimed at being a strategic and flexible approach that can incorporate change and variation over time, while retaining the desired overall areas and spatial possibilities. A computational method was developed using multiple layers of circle packing where individual programs organised through reactions to each other and the existing environmental/topological pressures as a self organisational system. The process/tools developed attempt to reatain the existing fgreen corridor and agriculture surrounding the waterway, while allowing for a hybrid urban grain nased on the density and urban scale of the informal city centre to weave into the existing topoly as a thickening of the layer(s), density and possibilities.